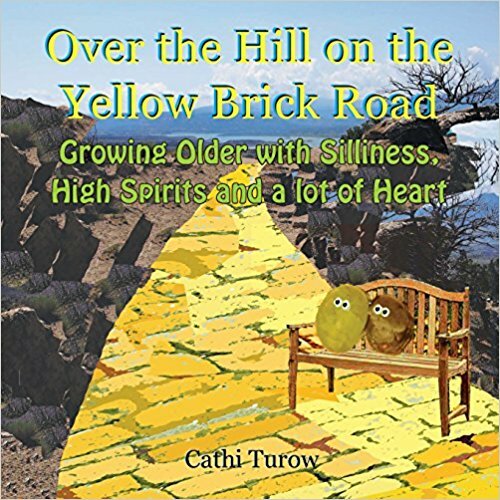 Walking Over the Hill on the Yellow Brick Road, I noticed an older sponge crawling in front of me. He was having a lot of trouble moving, so I offered to lend a hand. SPONGE: Yes, thank you. I’m older and I’m on overload. SPONGE: Well, I’m on my way back from a high school reunion. Everyone I knew from way back was there. The dish detergent…the Brillo…the bar of soap… We’re all aging. But some of us are feeling better than others. It works that way with people, too. It’s very hard to be part of whatever this phase of life is supposed to be. SPONGE: It IS very hard! And my problem is, as a sponge, I absorb it all. I take in everybody’s pain, plus my own, and now it’s weighing me down. In my older age, I can’t hold in all these feelings without having symptoms. I can hardly move. Sometimes it paralyzes me. I know what you mean. I’m most grateful to be here. But when I meet up with someone who has very serious health issues, I take in their feelings. I experience their feelings as mine, too. SPONGE: Today I saw the plastic bottle of dish soap I grew up with. She’s almost out of liquid soap. She’s scared. What will her life be like without the soap? They’ve been together forever. My heart hurts for her. I know someone who’s so sick he has no fight left in him. He doesn’t want to be here anymore. I feel his pain even though I can’t quite understand it. SPONGE: I know a bar of soap like that, too. She’s so thin she’s wasting away. She says being like that isn’t living anymore. When she speaks that way, I absorb her pain. But…are we supposed to be experiencing gratitude this way? Or are we supposed to separate our lives from theirs and live the best way we can at this moment? Oh, I love it. A conversation with a sponge could go in so many directions. You might have to have another conversation with him sometime down the road. Well, maybe. Sponges are very versatile. They soak up information, they get rid of germs and dirt, they see all kinds of grungy messes, they dry up, they get tough, they last a long time, they can lose parts and still function. I think they are perfect conversationalists. I bet they’d never run out of things to say. And then there is the conversation about it’s ancestors who lived under the sea…. That sponge could use a big squeezy hug…renewal happens like that! Oh dear, maybe it needs a new, younger detergent bottle friend. This post is so clever – love it! How you managed to write a post that speaks so eloquently to the human condition while using a sponge as your central character, I’ll never know. But you definitely pulled it off! And I agree with the last line: maybe both, indeed. Thank you so much. Deeply appreciated. That’s why I volunteered for the garbage detail. Ever since my wife started calling our sponge, Marge, I’ve let her have the dishpan hands. With sexual harassment being everywhere these days! You’ve invented a new literary genre, haven’t you. So, what’ll you call it? I could hardly stop reading those delightful dialogues. Glad I found you! Hi Arletta Ellington, thank you so much for your very kind words. They mean a lot to me. I took a look at your blog as well and I’m a new follower. I love your combined name–Arletta Ellington, and the unique voice of your blog. Nice to meet you. Those are very kind words in return. Thank you Cathi! So nice to meet you. Arletta sends her kind regards too. Thank you! I really appreciate the post meant something to you. I’ll check out your blog as well. Why is it that we soak it all in? I May have to borrow your sponge. Someone has to create it. As if we don’t already have enough choices…..
One thing I’ve experienced from watching the news this year is gratitude that things in my own life aren’t a lot worse. I haven’t been in a hurricane. I haven’t been in church or at a concert when a madman comes in and starts shooting. Trying not to absorb it all is a challenge! Wow. Excellent point. I think all those things you mentioned do affect us in an underlying way. There’s a sadness that lingers in the air. Very creative. Had a good laugh reading you. Thanks! So glad you had fun with this post! Means a lot to me.